I remember hearing about a slow-cooker method for caramelizing onions a few years ago, but never got around to experimenting until recently. I wanted to make French onion soup for a big dinner party, but was going to be away for several days so I needed to prep as much as possible, and certainly didn’t have a spare hour to make them on the cooktop. Figuring this was the perfect opportunity to see if the hype was real, I gave it a go, and let me tell you, it was like rediscovering sliced bread. The method is all but foolproof and perfect to do overnight. Get them going while you make dinner, let them do their thang all night while you sleep, and by breakfast, they’ll be ready to take any dish from a 6 to a 10. 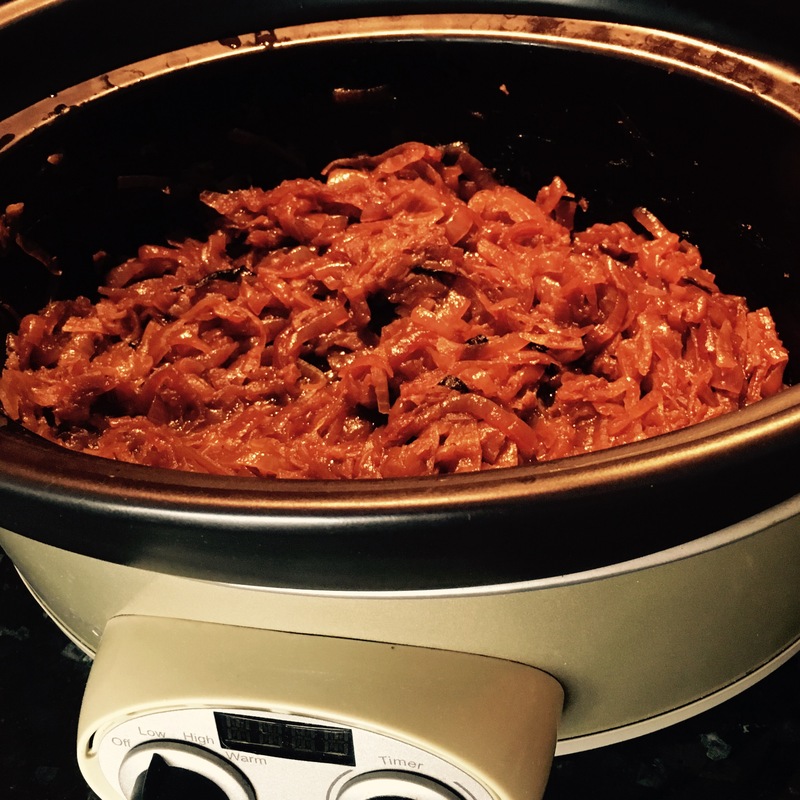 Thankfully, the effort yields a large batch and freezes beautifully, providing you with sweet, decadent caramelized onions for many meals to come (or for when you want to make the best homemade french onion chip dip ever, click HERE). Only two things to really know: 1) You might need to adjust the amount of onion and oil you use, depending on the size of your slow cooker, just use about one teaspoon of oil per cup of raw onions; and 2) Do not use salt until the onions are cooked, as this will draw out too much moisture and make them too liquid-y. Otherwise, experiment by playing around with different onions, oils, or herbs. Spanish yellow onions are classic, but Vidalias are wonderful for onion jam, or red onions, which create a beautiful color. Try olive oil, ghee or seasoned oils or toss in some red pepper flakes or fresh thyme or rosemary for extra flavor. I like to keep them basic to doctor up later, but it’s your kitchen and your rules. Enjoy! Prepare your onions by peeling them, cutting them in halves or quarters, and then thinly slicing into half- or quarter- moon slivers. Thoroughly toss with the oil and add to your slow cooker. Remember, 1 teaspoon of oil per cup of raw onions, and there are 3 teaspoons in a tablespoon. Cover and cook on Low for 12 hours. If possible, give them a good stir after 10 hours, return the lid and continue cooking. You can also cook for the onions longer, this will give them a more jam-like consistency. When the onions have cooked to the consistency you prefer, stir in the salt and pepper, then let cool. Portion out and freeze what you will not use immediately. I like to measure 1/2-cup portions and freeze them in those snack-size ziptop bags. Mix into soups, stews or dips, or top on pizzas or bruschetta, then nosh!